I'm standing in the kitchen with all the makings of your usual beef soft tacos. I just wasn't feeling it though. What I really wanted was a big fat burrito... which is a challenge to make if you only have 6 inch flour tortillas to work with. So I started to play around with my soft tacos and rolled them up into mini burritos. Then the idea of baking them came to mind and off the mini burritos went to bake. After they lightly toasted up, I served them and who knew they would be so well received?! My husband loved that they were easier to eat than your usual soft taco. I loved that they were baked instead of fried like the traditional chimichanga. And of course, you could fill these with whatever you'd like. Another bonus is that they make perfect appetizers for parties and get togethers! Combine the spices above in a small bowl and mix together. Store in an airtight container. Brown ground beef in a skillet over medium high heat and drain off fat. Add water and 2 tablespoons of the spice mixture. Bring to a boil and let simmer for 20-25 minutes. If mixture gets too thick before cooking is complete, add a small amount of water to thin. Spread a little sour cream on one side of each flour tortilla. 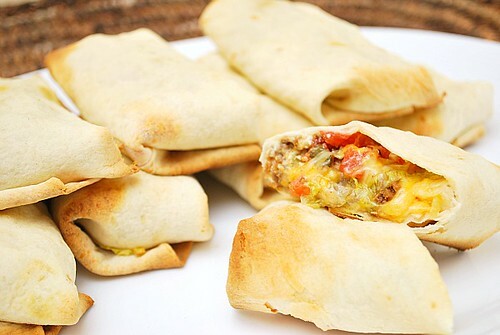 On the bottom third of the tortilla, leaving a flap at the bottom, fill each tortilla with a tablespoon of seasoned, cooked ground beef and remaining fillings as desired. Fold the bottom edge up over the filling and fold the sides of the tortilla in towards the middle. Beginning at the bottom, roll the tortilla up. Place the burritos seam side down on a lightly greased baking sheet. Repeat with all remaining flour tortillas. 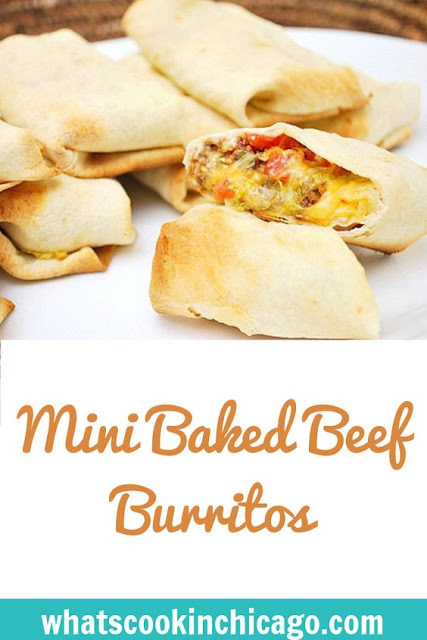 Lightly spray the tops of the burrito with cooking spray and place burritos in the preheated oven to bake for 5-10 minutes, until the tops are lightly browned. Remove from oven and serve hot with your choice of condiments (salsa, sour cream, guacamole, etc). Do you think this would work with corn tortillas as well, or would baking them dry them out too much? This is definitely one of those "why haven't I thought of this" types of recipes. Looks so yummy! Big hit at our house. Thanks! This was delicious however, 1/4 cup of water was not enough for 1lb of ground beef...after about 10 minutes my meat was dried out and there was no water left so I added a cup of water. Next time I am going to add more water at the beginning, there was no type of sauce after 20 minutes simmering. Also, I think 6 inch tortillas are too small, I felt like each burrito barely had any meat or filling so next time will choose to use bigger tortillas! I wonder how many calories in these, they look VERY yummy! Will be trying these for the fam-bam in the very near future.